Bruges (Brugge), which has no witches, and Ghent. On Wednesday morning, my friend and I woke up all too early and caught an 8:04 train from the Most Beautiful Train Station in the World, Antwerp Centraal, to a city in West Flanders that many Spanish believe has witches due to the name being “Brujas” in Spanish, which means witches. I had my Starbucks, which is a full 1,50€ more than Spanish Starbucks, which I try to avoid as the bar cutre across the street has better café con leche. However, I always make a point to go to Starbucks in every new country I visit, except Italia, who as of 2012 still did not allow Starbucks. Things may have changed by now. Yeah, I have to admit, Einstein Coffee was a bit better and a lot cheaper. But Starbucks is tradition. The train took about an hour and a half from Antwerp, and the landscape continued to remind me of northern Ohio, even more with the frost. After a 1 km or so walk from the train station, we arrived in the city centre. 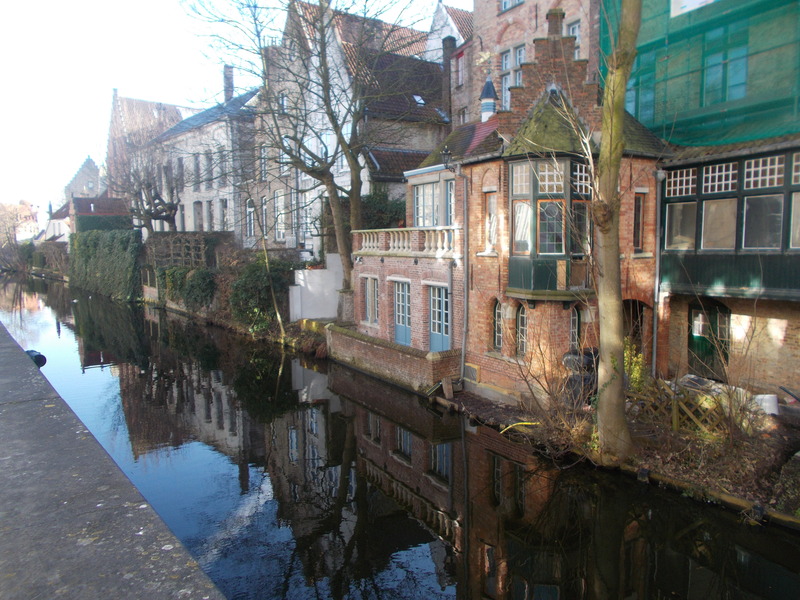 Bruges doesn’t allow buses in the city centre, which helps its UNESCO World Heritage Status. Bruges has a population of about 117,000 habitants yet receives around a million of tourists every year (more after being 2002’s European Cultural Capital). The city was once an important trade centre and later was important in making lace. Today it’s just a beautiful medieval city. As it was Wednesday, it was Market Day, so in their Grote Markt (Plaza Mayor), they were having a market selling vegetables and fruits and waffles (It is Belgium). I never really was a fan of waffles until I tried authentic Belgian waffles. Now I love them. We had our waffle and had a relaxing koffie (which comes with milk) in a café that seemed right out of a Swiss The Sound of Music. I found my souvenirs in a shop near the Markt, and after exploring a few of the buildings that make up this Markt (which is SO much better than the Grand Place/Grote Markt in Brussels, but more later) we explored the city and its canals. It really is the Venice of the North, but for me, it was better than Venice as I wasn’t having to duck into cafés to have yet another cappuccino to keep warm. My fave thing in the city was this lazy dog lying in the window, watching the canal go by. Luckily, we had beat the tourists, who started arriving in masses about noon. We grabbed a quick lunch on the go about 13:00 and caught the train to Ghent, a half hour or so away. 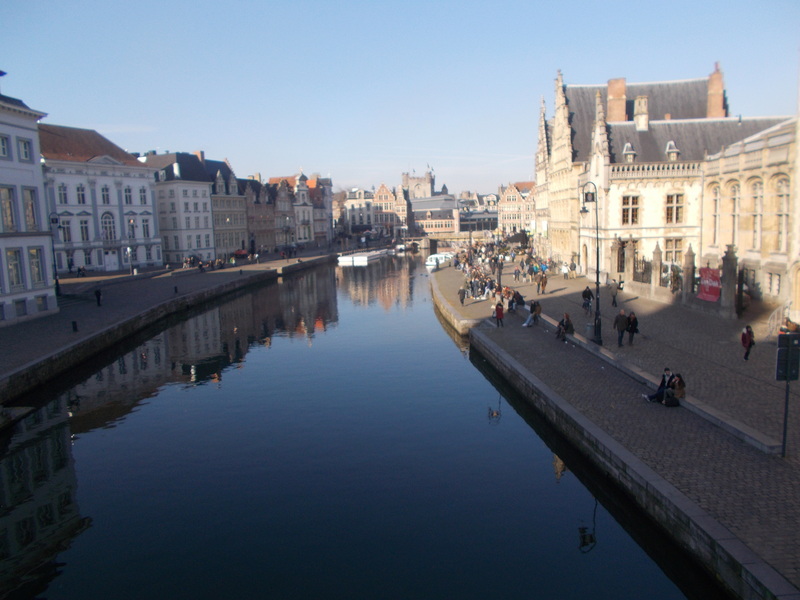 Ghent is a student city with about 250,000 people. The train station is located a good walk away through some not-so-beautiful places. The city was once important in the wool area as the river area is good for raising sheep. Spanish King Carlos V (Charles V) was born here, who was also Holy Roman Emperor. It is the third largest port in Belgium. My first impression was “meh”. When I saw the Cathedral and the “casco viejo” (old part of town, Spanish influences my English and I think “Casco Viejo” is English most days), I fell in love with the city. The Graslei, Gravensteen and Leie River were my fave parts. The centre was incredibly beautiful, and I could easily imagine the summer here, having a relaxing koffie on a nice terrace. We also managed to see Belgian-Puerto Rican celebrity Gabriel Ríos out for an afternoon stroll. We rested a bit with that relaxing koffie before heading back to Antwerp. ← Antwerp, home of the Most Beautiful Train Station in the World.